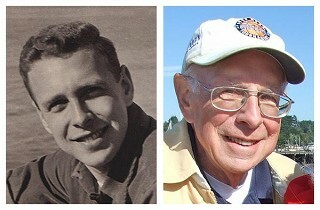 Don attended Portland's Vestal School, and Washington High, graduating high school with the class of 1947. He went on to work his way through college at Oregon State University, where he graduated with his engineering degree in 1952. It was during an OSU Methodist youth group meeting that he was introduced to the love of his life, Betty Tiedje. They courted during Don's senior year and were married December 6th, 1952, shortly after Don's graduation. They lived in Hermosa Beach for the first year of their marriage while Don took his first engineering job working for Standard Oil. Missing the family and the Pacific Northwest, In 1953, Don took a job with Boeing in Seattle, Washington, performing stress tests on B-52 bombers. With the news of his first grandchild on the way, it was Betty's father who encouraged Don to apply with the then-booming City of Eugene. Don was accepted immediately and joined the City engineering staff in September 1955. Don and Betty bought their first house in Eugene anticipating the arrival of their first child. Don started out in the public works department as civil engineer. He moved up the ladder to assistant city engineer, principal city engineer and, in 1969, became the assistant director of public works. Eugene more than tripled in size during Don's tenure of over 30 years with the City. He was directly involved and provided thoughtful direction to many of the projects that forever changed the face and scope of the city. Don was very dedicated to his work at the City and truly enjoyed his co-workers in all the many city and county departments he worked with. It was Don's polite good nature, humility, sense of humor, and professionalism that won him the respect and title of "The Gentleman" with his staff and co-workers. Don never had a bad word to say about another person. He was easy to get along with, so much so that Betty will tell you they never had one disagreement or argument in all 67 years of their remarkable marriage. There was nothing Don loved more than his family and spending quality time with them. He vacationed with his young family each year in Camp Sherman, along the Metolius River. They grew to love the area and bought a small piece of land outside Sisters where together, as a family, they built a cabin in 1969. It was in November of 1986 the notice was circulated to City and county employees, announcing "The Gentleman is Retiring." After 31 years of working for the City of Eugene Public Works Department, Don decided it was time to retire and enjoy more time with Betty and his young grandkids. Although he officially retired from the City, Don would work another five years as consultant for the public works department. In 1995, with their two daughters and their families living in the Sisters area, Don and Betty decided to remodel the family cabin into a home, and move to Sisters permanently. Don drafted a beautiful design and worked alongside the contractors to complete the home in 1996. Don and Betty kept very busy making many wonderful memories with their children, grandchildren, and extended family. When Don's nephew became the head men's basketball coach for Gonzaga University, Don and Betty became huge fans, often traveling to many home and tournament championship games with family. Don loved to visit, and if you knew him, you also knew all about the "Zags" and how proud he was of the team. Don and Betty made new friends and many wonderful memories with their family over the years that followed in the Sisters high desert country. Don, a mathematical genius, enjoyed helping all the kids in the family grasp an understanding of math. Don shared his many hobbies and talents with his children: he was an artist, he loved photography and developing his own film and prints in his darkroom at home, working with wood and refinishing antique furniture. He enjoyed working in the yard, and listening to ball games on the radio. He loved building models, running his model train set-up with his grandsons, and later built a large wooden train engine for the kids to play on in the yard. He loved hiking, backpacking, fishing, horseback riding, bicycling, and playing games of all kinds. It was your good fortune to be his pinocle partner. He loved to build, design and make things. He would make anything his kids and grandkids asked for, from doll houses to tree houses, to carving a wooden replica of his own '65 Chevy Impala. He earned the family nickname "The White Knight" when, year after year, he was the only person to stay clean during the family "Mud Bowl" football games played every Christmas day. He was also the only one in the family who managed to stay upright while gracefully playing ice hockey in street shoes on the frozen pond below the cabin each winter. He always hit a home run at the family softball game played after church each Easter Sunday, and could run like the wind. He loved old movies, big band and classical music, angel food cake, and black licorice. Don was quick to teach his children and grandchildren important life lessons such as how to whistle, tie a shoelace, skip rocks on water, fly a kite, ride a bike, the importance of honesty and humility, and to always give a firm handshake. Don was always a light of love and good humor, a blessing to all who knew him. September 28, 2018, Don passed quietly at home, surrounded by family. Over the last decade of his life, Don battled Alzheimers, and although the terrible disease took his brilliant mind, he remained the same sweet gentleman his family respected and adored. He lived a long, full, and wonderful 89 years. Don is survived by his wife Betty, son Bill Gilman, daughters Mary Hedren and Kristi Gilman-Miller and their families, including seven grandchildren, six great-grandchildren, and a loving extended family. Don was a humble and generous man who always put the needs of others above his own. He taught three generations of his family how to be kind, gentle, and thoughtful. Those of us left behind will strive to carry on those important qualities he instilled in us. In tribute to Don's humble spirit of generosity and kindness, the family encourages donations to Alzheimers research in Don's name.